The wet grass poultice was directly pressed into the paper. Here is the fourth anthotype; one of at least two made with grass pigment. 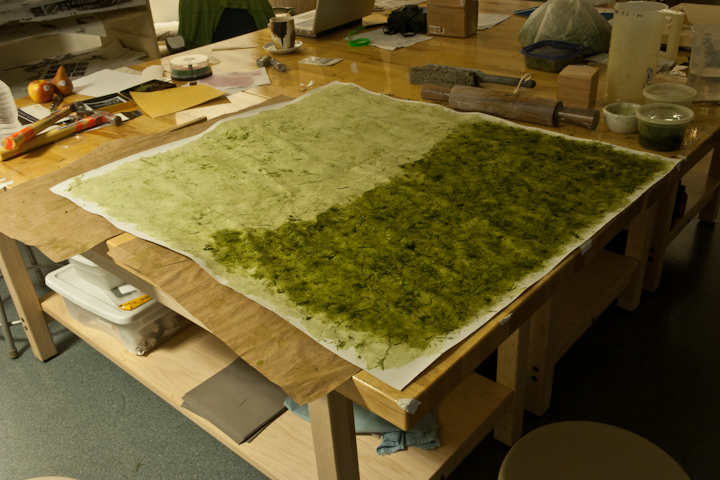 This one is grass stained instead of a brushed on liquid due to the qualities of the paper. It was tedious but [I hope] it will introduce artifacts from the the hammering of the grass poultice directly onto the paper. The other grass anthotype to go in the third window (closest to the brick work in the last picture) on Tuesday will have a brushed on emulsion. You may be familiar with the expression “The Grass is Always Greener On the Other Side”. 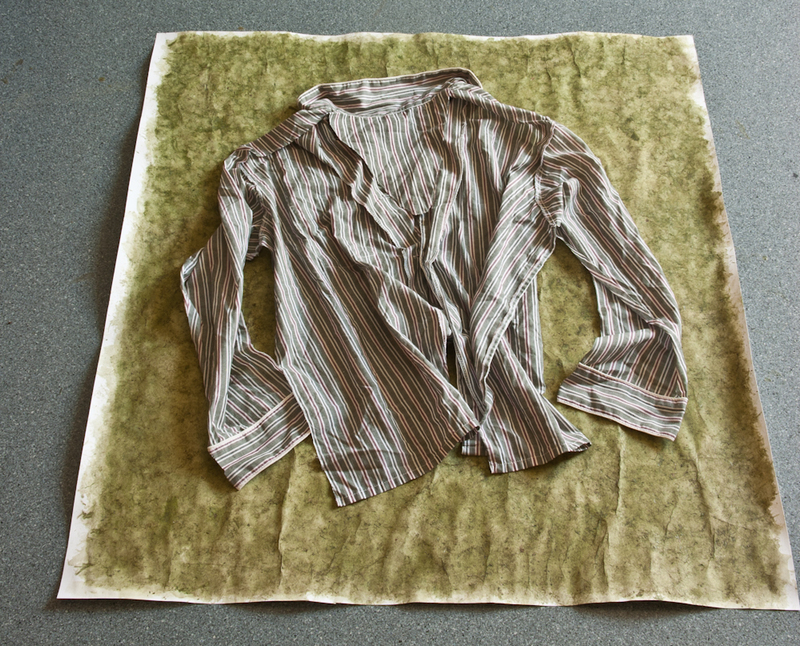 Imagine a 40″ x 36″ sheet of paper in which the green of the grass stain is greener on one side. Imagine me in my studio wrestling with said paper. I’ve unintentionally created, at least as of this afternoon, an homage to Mark Rothko. Below is an image from last night. As of a few minutes ago I think I corrected the issue. Now I just need to remove the larger chunks of grass that I don’t want in the final photogram. The rose petal anthotype came down last night. I haven’t had time to document it but take my word, after an 18 day exposure it looks fantabulous. During the class visit to my studio, Cynthia Fowler noted appearance of a family of anthotypes in the making. Now for a little shameless self-promotion. The Ohio State Fair Fine Arts Exhibition is now open and will run until August 7th, 2011. Juror Eric Weeks has selected “Apple” for one of the three Juror’s Choice Awards in the professional division. For the complete list of award winners in both the professional and amateur divisions, please visit http://theohiostatefairfineartsexhibition.blogspot.com/2011/07/2011-award-listing.html. They cut the grass on the Emmanuel College campus so today I went into manic mode. Wet grass clippings is chance favoring the prepared studio artist. Mainly pictures this morning / night. I have been struggling with using grass as a pigment for the Anthotypes. The first one, because of the quality of paper and five coats, worked out well. This was coated days ago before the lawn mower cuttings became available (today). It is just waiting for the subject to arrive in the mail which is the fodder for a future blog entry. The second and third attempts are another story. I will let the captions do the talking. Besides the green, I have a discovery to report. The rose pigment is very sensitive to ambiant light i.e. fugitive! Please see the last picture. The first attempt at grass which worked out well due to five coats of emulsion and the quality of the paper. 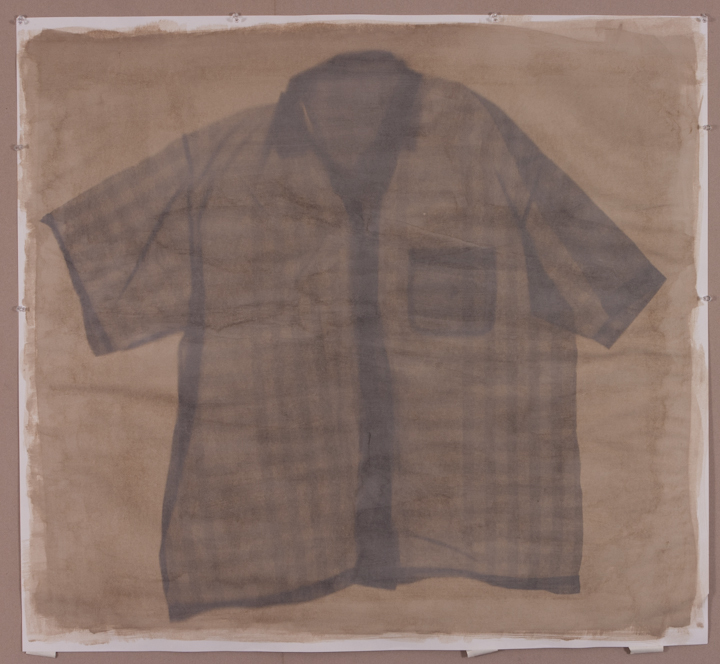 The Utrecht drawing paper soaks up emulsion and shows streaks. 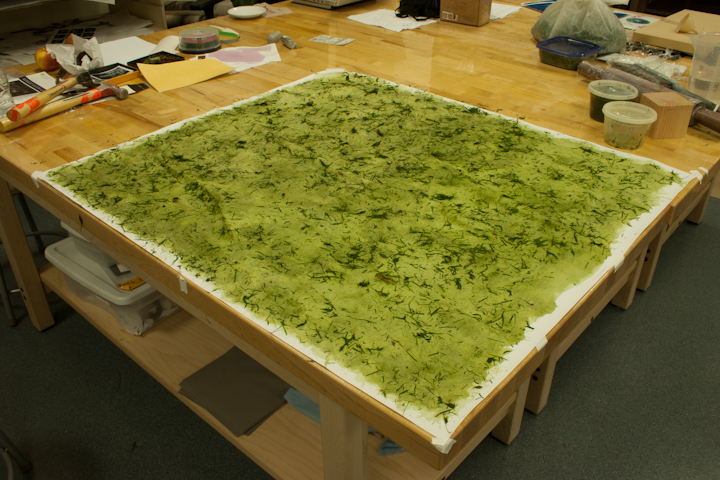 This is actually grass poultice pressed on top of the paper. In the photo above you can see this along with the second attempt. Red rose pigment exhibiting signs of pattern fading after two weeks exposure to room lights. I have come to the realization that I need to increase my vocabulary and choose my words more carefully. Pulche is used in a discussion of fleas whereas poultice is more appropriate in describing a soft, wet mass of plant material which I have been creating in making anthotype pigments. Anthotype science. I like this kind of stuff. The rose petal extract demonstrates a classic pH indicator color change. I wish I had a pH meter to compare my guesses but for now these estimates will have to do. I noticed that when I washed out anything that had been in contact with crushed red rose petals, it would turn the water blue which would be around pH 7. Last week when I suspected the leftover rose petal extract was oxidizing to a brown, I added a classic food preservative, citric acid, to the fresh rose petal emulsion. It went from a cool red (pink red) to a warm red (crimson). Yesterday evening I again added citric acid to the latest batch of red rose petal emulsion and saw the warm red effect. In washing out one of the beakers I created about 3oo cc of faintly blue water into which I added a pinch of citric acid. It shifted the water to a faint red before it went clear. Now the question is, what was the pH of the pinch of citric acid in water that I created? Probably pH 4-5. In creating some green Anthotype emulsion from grass, I noticed that adding citric acid created more of a brown green or olive color and possibly contributed to flocculation. For the grass I am probably going to just use distilled water and crushed leaves (blades). 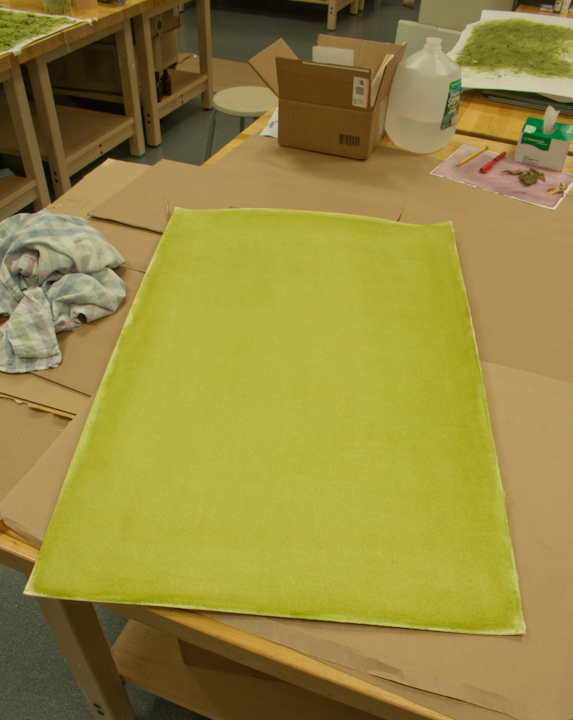 As of yesterday, the sheet of paper I have coated has about 5 coats of green applied to it. Pictures soon. Of immediate concern is tracking down some coffee this morning. Here is the second anthotype taken down from the window last Thursday. A few reviews alluded to drawing characteristics. It is a photogenic drawing (in purple). The iris petal emulsion was applied drop by drop (yes, I’m nuts) onto Kochi washi paper. Hence the pattern. The pajama was red fleece with trains and no name on it. If you have a suggestion for a title, I’m all ears. BTW, I have been adding a dash of citric acid as a preservative to my latest flower pigment emulsions (in solution). Today I noticed that the red roses I was grinding up returned to their warm red shade with citric acid instead of the cooler red / purple with just water. This is the first anthotype to be completed at the residency. 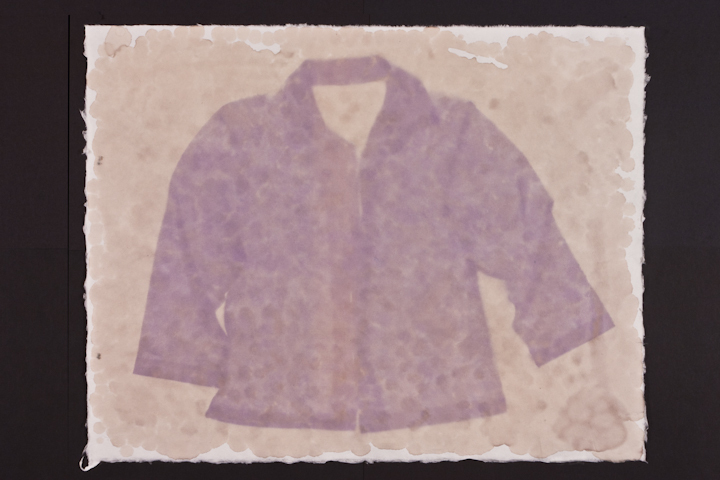 Mulberry pigment coated onto Utrecht drawing paper and exposed for 27 days (with about 5-7 cloudy days). Tentatively titled “Charles Tesconi”. 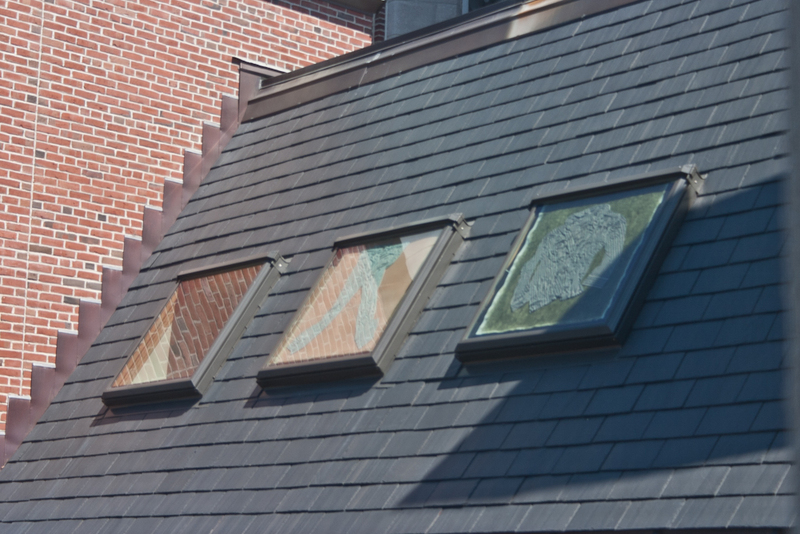 The yellow one is now installed in the window and appears to be fading quickly. 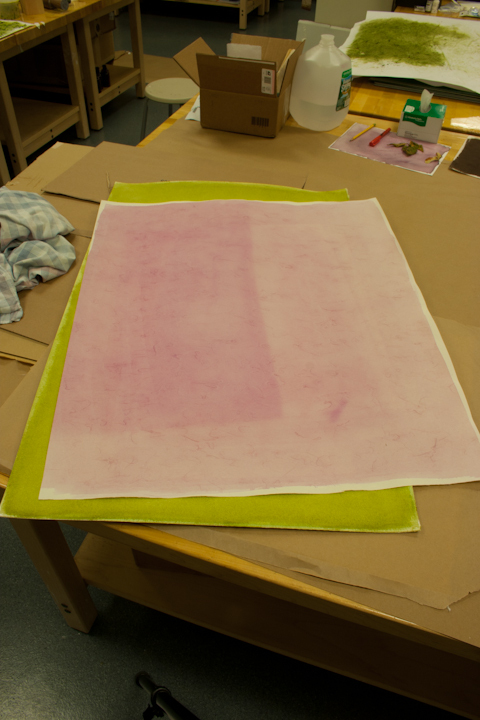 The rose petal anthotype should be ready for unveiling next Thursday. Tomorrow I will budget in time to document the two anthotypes which I pulled from the window earlier this evening. For the record, the mulberry on Utrecht drawing paper was exposed for 27 days, just shy of four weeks. The iris pigment print (yes, it sounds like a confusing mixture of Iris print and archival pigment print) took 19 days. In the meantime, I arranged the pajama bottoms on heavy weight watercolor paper coated with the Black-Eyed Susan emulsion. 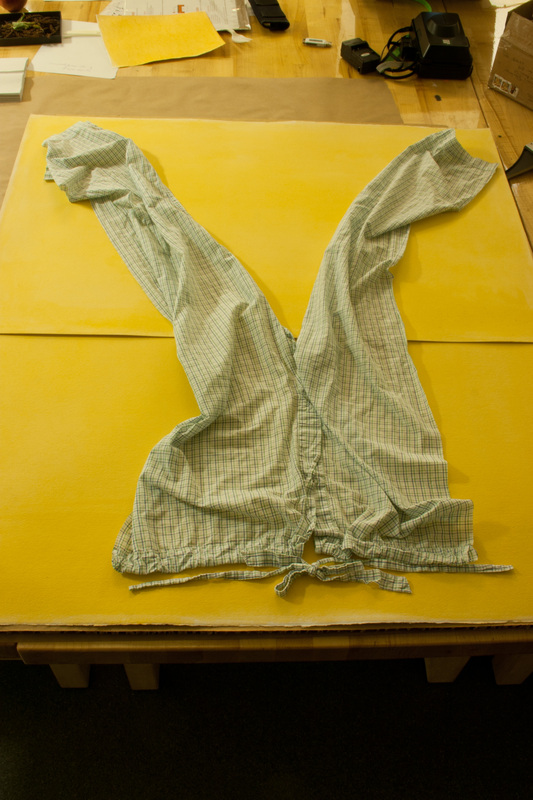 The yellow represents three coats of the flower emulsion (air dried between coats) on two separate sheets.